Excuse me, gentlemen, as I gush about this product. It is a primer, moisturizer, sunscreen and foundation all in one. I couldn’t believe how soft it made my skin immediately after putting it on, and the coverage it provides is much better than any foundation I’ve ever tried, and oh, have I tried many! This cream has sped up my makeup process. For that, this stuff if priceless. I’m preparing for a vacation, and this 2.5 oz. tube will fit those tricky TSA carry-on regulations, plus I won’t have to bring along my primer and foundation. I still use a moisturizer with sunscreen in it under the B.B. cream for extra sun protection. 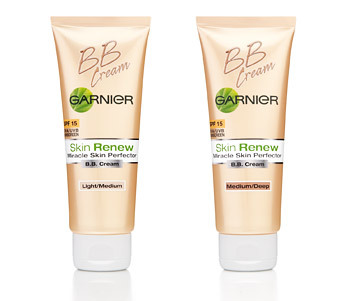 Garnier isn’t the only company making B.B. cream, but I have liked the Garnier moisturizers I’ve used, so I thought this would be a safe bet. The advertised price is $12.99, but look for sales and manufacturer’s coupons (of course that’s how I bought mine!). My only real qualm is the cream only comes in two shades: Light/Medium and Medium/Deep. It blends well and seems to match my skin tone but not everyone may be so lucky. Ask your local Ulta stylist if you can sample it. Are there other B.B. cream brands you’ve used and liked? Did any fall short of your makeup dreams? To compare, here is Green Day’s “Oh Love.” Don’t burn your eyes out trying to watch the lyric video. You say you aren’t a Carly Rae fan? I’m determined to turn you into one. If you’ve had just about enough of her begging you to call her, maybe, delve into her curious side with the second single off her “Curiosity” EP. The song, released in May, hasn’t heard a lot of radio play yet, probably because CRJ is still comfortably riding the 60-foot “Call Me Maybe” wave.